In today’s life every person looking for a non –toxic light source which will protect the environment from getting harms. LED light have no flames, smoke or any harmful toxic. And in the traffic safety, a good lighting source is required. Whenever the lights go off or in some emergency you need a proper light as a backup it is the most important thing which will need during an emergency situation. Emergency light is always required whether in a huge storm or when a car hit the electric pole, huge traffic accident, tornado, we should always prepare with the emergency lighting as a backup. LED road flares are environmentally safety emergency source of light; it is flameless, non-toxic, waterproof, and crushproof included by a variety of ultra-bright LED light instead of flame. The LED road flares are great alternative compared to other flares, through LED any car accident around roadways or in any traffic changes can visible clearly. LED is used in lots of application for traffic safety requirement. For traffic safety a new innovation is developed which is super-sized road flares it has features of LED technology.in this flares the different features are included like flashlight patterns and also these flares are smoke and flame free.in this self-charging is also developed and in one charge it can last up to 10 hours. The LED flares are using everywhere; it will help the person to take the necessary action during the emergency situation. Even also it is very easy to use and it is a smart way to save money. The Rechargeeable Led Road Flares 6 Pack work well and are a great safety and emergency light as well as ones to keep around the home for safety and regular use. 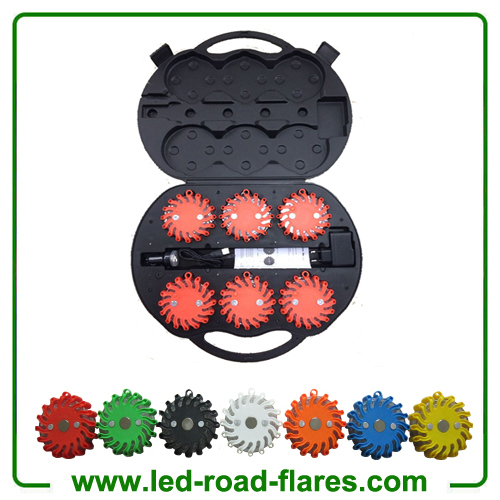 Rechargeable LED Road Flares 6 Pack is the 9-in-1 highly visible LED flare. The Rechargeable 9 in 1 Led Road Flares is an ingenious safety product that should travel with everyone who drives a motorcycle or car. This compact ultra bright flare will make you and your vehicle visible from a half mile away. The ultra bright led light has 9 different functions and light patterns. Several light patterns are directional so it can be used as a flashlight for roadside repairs and inspections. 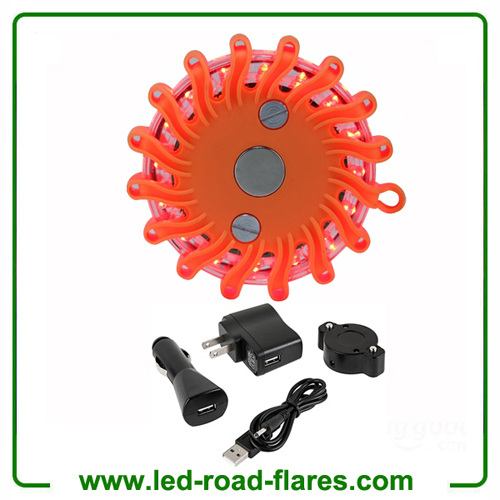 The Rechargeable Led Road Flares 6 Packs has 9 functions with the ring of red Led lights that circle it giving you the various combinations using an included computer circuit to light up the RED LED’s. The light combinations include rotating around the puck, quad flash, single blink, alternating blinks, SOS Morse code, steady on with high and low output, 2 and 4 LED flashlight. 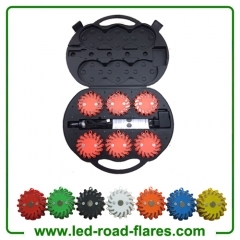 The Led Road Flares 6 Pack is a great safety light with the various attention getting flashing and blinking lights along with the on with two or four of the LED’s to use for a regular flashlight. The two and four LED lights work well for emergency use like changing a tire or finding your way when the power goes out while the rest are great for attention getting. Why LED Road Flares are of Exclusive Options for Car Owners/Drivers ? Are you looking for a sophisticated lighting system to install in your car or other similar vehicle? If your answer is yes, you should go for LED powered flare lights. Strobe lights or LED flare lighting system is an advanced device capable to perform different types of functions and that too by working as a power saving option for its users. In this article, experts have attempted to mention various exclusive features of LED flares and lights available in the market to meet different purposes, along with the functions as lighting systems in vehicles.